Thank you to you all who have left me some very kind, caring, supporting words! It really does me good to read all your get-well-soon messages and prayers from across the ocean. I am still in recovery after surgery. The surgery itself had some complications, and recovery had been slow, but the good Lord had shown His mercy and made small miracles for this little sinner which is me. Praise Him forever and ever! If you have followed my blog for a while, you might know that I just love colors. Especially in an outfit. My Mom often criticize my fashion sense, saying that my love for cheerful colors, pattern mixing, daring color combination, tendency for over-accesorizing, Hello Kitty, various shades of pink and all things cute and kawaii as kitschy, childish, and unclassy. She herself loves neutral colors, simple lines, high named brands, and animal prints. She oozes class and exudes elegance. Well, yeah, I admire Audrey and Coco. A lot. But I am not them. Elegance is not my first, middle, nor my last name. I love looking at pictures of high-society ladies like Ivanka Trump and Aerin Lauder. I admire their fashion sense and simplicity. But I know that if I wear what they wear on a daily basis, I would get bored pretty quickly. Their fashion sense is their own. Mine is mine. And my fashion sense can be summed up in M3F as I wrote in About section of this blog: modest, frugal, feminine and fun. And I would underline the word FUN. Fashion is what get me going out of bed in the morning, most of the time. I'm not a morning person, waking up early to go to work or pretty much to do anything early in the morning is a hard chore. However, thinking about all the pretty colors and fun outfits and accesories that I'm going to wear that day makes me excited and want to throw aside the blanket, get into the shower and start my morning preparation ritual that would set the tone for the whole day. Granted, once I'm dressed and dash out the door, I would forget about what I wear. And that works for me. By liking what I see in the mirror before starting my day, I start the day in a joyful mode and soon after I can focus to do whatever it is I need or want to do for the day: go to work, go to the park with my son, meeting friends, trying out new restaurant, clean the house, prepare holiday decoration. My morning ritual - beauty and fashion - is like what a stage actress does before she starts the show: make up and preparation to get into the role. My role is not an elegant lady of leisure that covers the page of a magazine. My role is a daughter of God, a wife, a mother, a career woman, a business owner, a middle class woman who loves life and embraces it with open arms and sparkles in her eyes. A woman who loves colors, Hello Kitty, pinks, and kitschy, cute stuff. Tacky to some, pretty and fun to me. And that's OK. Take a look around you. The color of the sky, the different shapes of flowers, birds, texture of grass, food, architecture of buildings, different bone structure of people around the world. Can't you tell? The Lord loves beauty and variety. After all, if all women look like Ivanka and Aerin, Coco and Audrey, don't you think the fashion world would be a little bit boring? After all, it's their individuality that makes these magnificent ladies stand out among everyone else. That's why Kate Spade is one of my favorite brands. It's fun, colorful, good quality, and relatively affordable. 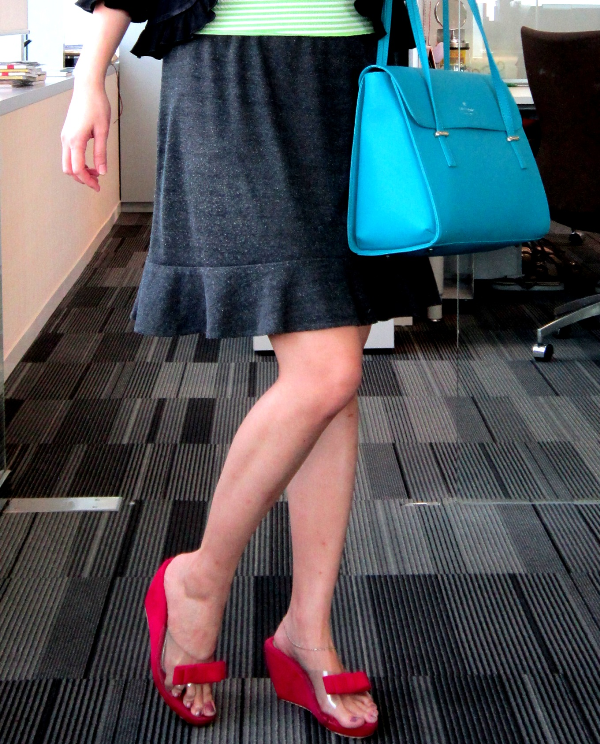 I love this Kate Spade purse in tosca. The color is fun, the shape classic, and it can carry a multitude of things. 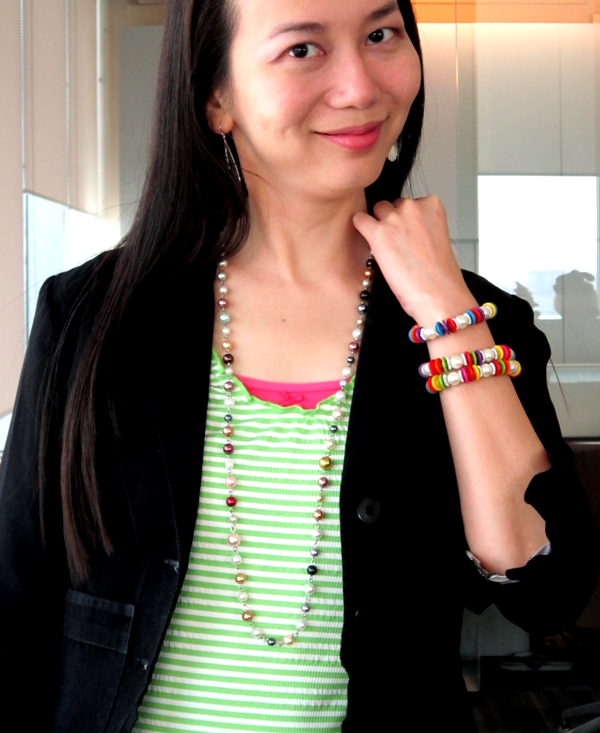 I finish the look with hot fuschia wedges with this cute bow and colorful beaded necklace and bracelets. Unclassy? Maybe. Fun? Absolutely. I am so sorry to hear you have had surgery. I hope that you are doing much better by now. You always look so nice in such carefully put together outfits. I love colors too. I don't mix quite as many different ones as you did in the pictures, but I think they definitely look fun on you! I agree that - no matter what style - if everyone dressed the same it would be boring. Best wishes! thanks for linking up with TH Tuesday! I didn't know you had surgery! Praying that the pace of recovery picks up soon. Love your color - it's amazing how that can really inspire us and put us in a good mood! That is more than ok! I love the pop of colors in your outfit! Thanks for sharing at Thursday Favorite Things! This woman love colors and Hello Kitty, too, that's why I really love this outfit, color combo and your style.